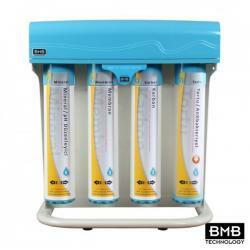 Reverse Osmosis Water Filter - How Do they Work? 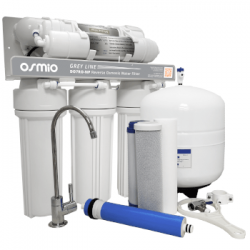 If you are looking for a water filter you will doubtless have come across the term ‘Reverse Osmosis Water Filter’, sometimes just abbreviated to RO unit or RO system. But what is reverse osmosis filter, how do they work and how do they differ from other water filtration systems? In normal osmosis, a solvent migrates from an area of low concentration through a semipermeable membrane in to an area of high solute concentration (low water potential). In reverse osmosis pressure is applied to overcome the normal osmotic pressure and reverse the direction of ions, molecules & particulates. This pressure is ideally achieved by the normal incoming water pipe pressure, however if this is too low then there are reverse osmosis systems available which have built in pumps to ensure constant optimum water pressure. 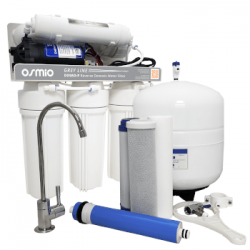 The heart of any reverse osmosis water filter system is the membrane. The membrane is a spiral wound sheet normally made out of a thin polyamide layer (<200 nm) which is laid on the top of a polyethersulfone or polysulfone porous layer (of approximately 50 microns thickness) which is placed on the top of a non-woven fabric support film. This arrangement known as thin film composite (TFC) allows the filtration of particles down to the molecular level and results in highly purified water. Whilst a reverse osmosis membrane is quite able to deal with all biological hazards such as viruses and bacteria it is sometimes the case that RO systems are offered with the addition of ultra violet disinfection to ensure the destruction of all biological hazards. This is due not to the ineffectiveness of the RO membrane itself but as a safeguard against leaking seals and film build up in the system. This is a consideration mainly on many of the cheaper models available, care should be taken therefore to select a system which employs only better quality plastics and seals such as the BMB range or the Greyline series and which can supply certification for quality standards. The capacity of the RO membrane is expressed in GPD or Gallons Per Day as a maximum and typically range between 50 and 100 GPD the actual maximum depending on factors such as water pressure, the age of the membrane, water hardness and temperature. What Will a Reverse Osmosis Membrane Remove? This is by no means a fully comprehensive list but gives an accurate indication of what percentage of common contaminants can be expected to be removed from the drinking water. 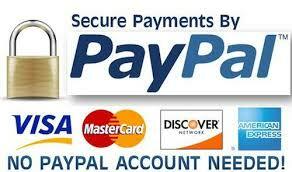 These rates may be further enhanced by one or more carbon filters which are normally included in a system. 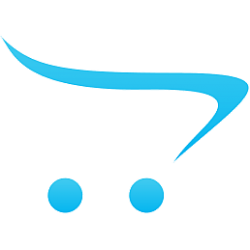 A typical system will consist of a number of filtration components. - A 5 micron sediment filter - designed to remove sediments & particulates and protect the filters that follow from clogging. Between them these filters will reduce or remove Bacteria, E-coli, Chlorine, Sediments, Nitrates, Fluoride, Limescale, Dissolved Solids (TDS), Hormones, Pharmaceuticals, Heavy Metals, all before the water has even reached the RO membrane. As you can see the filtered water produced by even a basic system is of a very high order of purity. Composed of active ceramic tourmaline balls which form a 2 micrometre wavelength electro-magnetic field (far infrared-red ray - FIR) along the water passageway. As the water passes through the filter, the FIR helps in breaking up the water molecules (which are usually clumped together) into smaller associations which assists in the maintenance of a healthy body metabolic rate.